By participating in this promotion, entrants agree to the rules set out below. The Competition shall commence on 1st February 2018 and will end on 30th April 2018. No entries received after 30th April 2018 will be considered. 4.1. 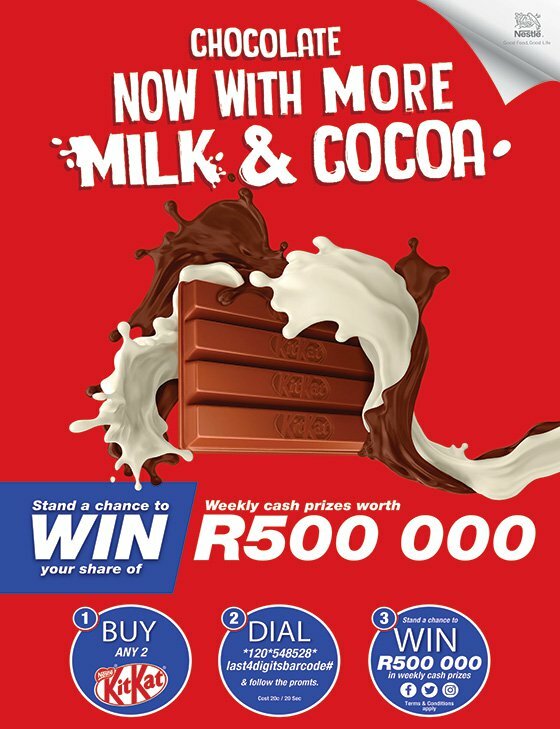 Participants must purchase any 2 of the KitKat products listed below and dial *120*548528*last4digitsofbarcode# and follow the prompts to stand a chance to win R500,000 in weekly cash prizes. One (1) of Fifty (50) x R10,000 (ten Thousand Rand) Cash Prize.